The Edmonton Oilers are in the process of putting together a team that can compete for years to come; at least that’s what new GM Craig MacTavish would like. He doesn’t want a one and done, a team who sneaks into the playoffs, gets swept, and doesn’t get back again. He wants to build a competitive contender, and judging by the pieces they already have in place, they’re on their way. But the Oilers are still lacking some crucial parts. Toughness on defense for one, and some more stability in goal. One area they certainly need to improve is the size up front. They could potentially go after a guy like free agent Nathan Horton for example. Or, they can take advantage of a recent buyout. Vincent Lecavalier came into the NHL with much fanfare. He was seen as one of the best prospects in a while, one person even called him the “Michael Jordan” of hockey. He was big, he could skate, and he put up huge numbers. The Tampa Bay Lightning chose him first overall in the 1998 NHL draft, and went on to name him team captain in 2000. Lecavalier has not scored less than 20 goals in a full season since his rookie year. He won the Rocket Richard trophy in 2007, scoring a career high 52 goals. That season, he also notched a career high in points with 108. Though he wasn’t able to sustain those lofty numbers, he still put up 40 goals and 89 points the next year. His totals have dipped the past few seasons, due in part to injury troubles. He was a huge part of Tampa’s Stanley Cup championship in 2004. But with the salary cap going down, and the new CBA giving teams an out-clause for big contracts, the Lightning have elected to buy out the remainder of Vinny’s contract, making him a free agent. The Edmonton Oilers have space under the cap. They can afford to sign free agents to shorter term contracts. There are a few reasons why one target should absolutely be Vincent Lecavalier. The Oilers nucleus is very young. They could benefit from a veteran voice in the locker room, especially one who’s been there before. Lecavalier is a Stanley Cup champion, and knows what it takes to win. He’s not old by any stretch, and at age 33 he still has a lot to give. Obviously, the Lightning felt cutting ties was the best thing for the both the player and team, and Vinny’s veteran presence will be a huge boost for any club. At 6 foot 4, 218 pounds, Lecavalier has something most of the other Oilers forwards don’t have: size. He’s not afraid to mix it up and throw his weight around either. He can fight if he has to, he can hit and he can create space for the speedy guys on the Oilers. He may have a slowed a bit over the years, but make no mistake. The skill that made Lecavalier a star is still there. He’s got great hands around the net and can make creative plays with the puck. He has shown that he can still be an elite player in the NHL. He plays the center ice position, making him a perfect fit for the Oilers second or third line, depending on what happens with Sam Gagner. Lecavalier doesn’t need to be the star or the captain. He understands those days are likely behind him. But he’s still hungry to win, and the thought of going to such a talented team on the rise might be intriguing to him. Will the Oilers make a move? If they do, would he even be interested? All these buyouts are giving teams around the league a chance to go after players they otherwise never would have a chance to. 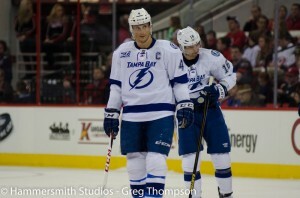 Lecavalier is one of those players. May as well give it a try, Edmonton.